About 16 months ago, Honolulu tour guide Erik Storm of Kilauea EcoGuides, places his GoPro camera into a crack to film the lava flows. 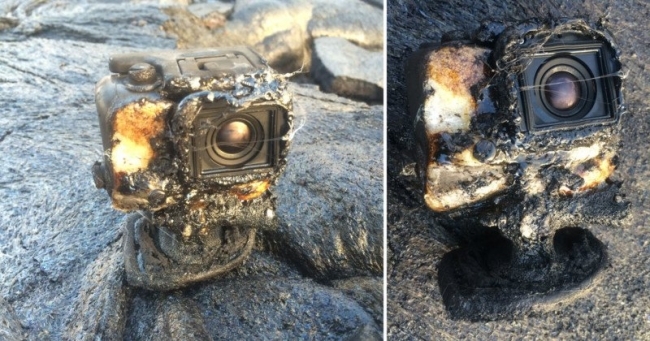 “I was telling a story when the molten lava completely engulfed my GoPro (with housing on) and it caught on fire,” Storm tells PetaPixel. “I used a geology rock hammer to pull it out of the lava and thought it was a total loss. After getting back home, Storm hammered the cooled rock off the GoPro housing. He suddenly noticed that the Wi-Fi light on the camera within was still blinking. When he pulled the SD card out of the camera, he found that the footage was still intact. The last video on it shows the camera getting engulfed by lava and flames bursting into view.